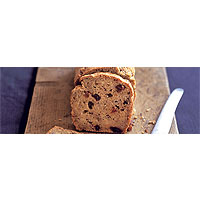 Sugar affects the moisture-retaining properties of food, and as this bread doesn't contain any added sugar – only the natural sugars in the sultanas and bananas – it will dry out quicker. So, invite some friends and plan to eat it all on the day it's made. Preheat the oven to 180°C, gas mark 4 and grease a loaf tin (19cm x 9cm x 6cm is perfect). Combine the flour, baking powder, sultanas and a pinch of salt in a large bowl and set aside. Blend the butter with the eggs, vanilla, orange zest and bananas and stir well to combine. Stir the wet ingredients into the dry so they're just combined (don't overwork the mixture) and pour into the loaf tin. Bake in the oven for around 50 minutes to 1 hour, until a skewer inserted into the loaf comes out clean. Remove from the tin and place on a cooling rack. It's best eaten slightly warm.